We have two houses and have had wrens every year. This year we hear them singing, but I don't think they are nesting. I have heard that you don't clean the house out. Is that correct or should we clean it out? By cleaning out a nest box you help deter parasite infestation, a predator’s ability disturb a nest through the entrance hole and it’s a good time to evaluate the house’s condition. You should definitely clean out all bird houses at least once a year. I like to clean them in September after the nesting season. I encourage people to clean out bluebird boxes after each nesting or at least every fall because they aren’t good excavators. Bluebirds just build on top of old nests until the babies are sometimes are too close to the entrance hole and fall out before they are ready to fly. 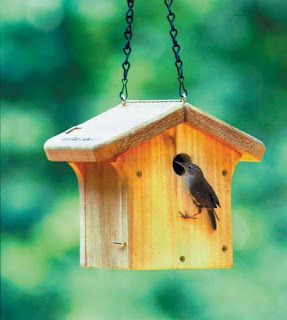 Wrens can clean out their own box and the presence of a used House Wren nest may actually encourage wrens to re-nest. But you should check to make sure the nest doesn’t have any unhatched eggs or pests. If it’s a mess inside and the drainage holes are plugged go ahead and clean it out. You can leave some sticks below the house to help them rebuild. There is usually at least a two week window before they nest again. To clean the nest box I usually place a plastic bag over the nest and just sweep it all in and twist the bag shut. You can rinse out the house with a water hose or diluted bleach spray. Make sure the drainage holes are unplugged and leave the house open to dry for a couple days. Finally dispose of the old nest in the trash and wash your hands thoroughly. Thanks for this post. I hung a decorative ceramic bird house in the yard last year and was surprised to find wren's nesting in it this spring. They have now flown the coop and I was wondering if they will re-use it. I see them flying around the yard this morning. Should I just wait until early fall to clean it out? It does have a removable bottom.